I am terrible at accepting praise. Those who know me will know that this is not a boast, but rather a hard admission to a deep character flaw. When offered accolades, my first instinct is to deflect and downplay their significance. But I have come to realize that this is a dishonest impulse, a drastic, dramatic form of self-effacingness that not only hides my true feelings, but can actively damage my relationships with others. To reject praise from others for the sake of being humble is, in a sense, to negate their opinions, to call them liars. Rebuffed by this constant dismissal, I see how even genuine goodwill can eventually turn sour. I don’t want that to happen. With gentle but firm reminders from friends and family, I am working to accept praise better, especially when it comes to writing, partly out of a desire to better respect the opinions of others, and partly because I believe my work is worthy of recognition. Orwell once wrote in his famous essay, Why I Write, that “it is humbug to pretend that [sheer egoism] is not a motive, and a strong one.” I remind myself that it’s OK, even necessary, to indulge the ego in modest doses, to take it out for a stroll when the occasion warrants, albeit on a firm leash. I am very proud to have placed 3rd in Green Living, 2nd in Science and Nature, and 1st in Writing and Literature. I would like to extend congratulations to all the other nominees, finalists, and winners. I am also deeply grateful to the volunteer jury for their judgements, to Elan Morgan for hosting this year’s awards, and to all the readers and contributors of Ekostories. Thank you for the acknowledgement! How do you handle and accept praise? Is there a difference between modesty and humility? If so, what is it? Appreciate the kind compliment. 🙂 Always enjoy your artwork as well. I agree it can be hard not to deflect praise, but it’s true that it can come across rude because it negates the giver’s opinion (or implies they don’t know what they’re talking about). It’s tough to teach yourself to accept praise! I’m still working on that. I was intrigued by your second question about modesty and humility. To help clarify my thoughts I looked the words up on Merriam-Webster, because the words to me have a subtle difference of meaning (and MW did confirm that). In my mind, being humble is to accept praise without letting it go to your head or tacking on anything that inflates the praise (e.g., if someone says that you’re a skilled artist and you say “I’m not just skilled; I’m talented!”) Modesty is avoiding unwarranted bragging (e.g., inappropriately bringing up your work and talking about yourself when the conversation was about something else). I think they’re intertwined, though: they have a closer relation than two sides of a coin, but they are not the same. Hi Nicole, thanks for mulling over my question and providing a very thoughtful answer. I’ve been turning it over in my mind as well, and I agree on a key thing that you touched on, that being humble falls more in the realm of interaction with others, while the core of being modest is to have a realistic assessment of your own abilities and to know yourself well, which naturally projects out to be behaviour like not talking yourself up when you know you can’t back it up. 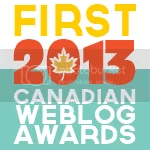 Congratulations on winning three awards with the Canadian Weblog Awards! That’s amazing! My blog won third place in the disability category and I’ve been very humble whenever anyone comments on that fact. But without the Canadian Weblog Awards I wouldn’t have found your blog, and I feel completely honoured to have my work admired alongside yours! Seriously, this blog is super impressive and I look forward to having it on my blogroll. Great work! Yes, one of the good things about being nominated discovering a whole bunch of great work being done by others across a range of topics. Congratulations to your win and to your blog. I salute your courage in speaking about a very difficult matter that affects so many people, including those I care deeply about. Keep up the great work, and I look forward to reading about your journey. Just catching up with everything…your recent interview and blog award are timely and earned. Congratulations from a fan.